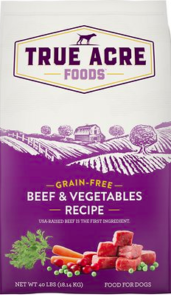 True Acre Dog Food|Good Or Bad? True Acre Dog Food|What Is It? The first ingredient within the recipe is a source of meat (Beef /Chicken) that comes from the USA. Vegetables used in the formulas are sourced from trusted and reliable farms based in the USA and Canada. All other ingredients are sourced from the USA and suppliers Worldwide who are reputable and meet quality standards as well as FDA regulations. The first ingredient (Beef or Chicken) provides a healthy source of protein that provides energy and helps to support lean muscles. Natural fibers within the recipes are easy on the digestion, while omega-3 and omega-6 fatty acids promote a healthy skin and coat. Healthy farm-grown fruits and vegetables that are used in their recipes. Ingredients do not contain any grains, wheat, corn or artificial preservatives, colors or flavors. Complete and nutritious kibble with a taste that dogs seem to enjoy. Beef, Peas, Pea Starch, Poultry By-Product Meal, Canola Meal, Soybean Meal, Tapioca Starch, Poultry Fat (Preserved with Mixed Tocopherols), Natural Flavor, Dried Plain Beet Pulp, Dicalcium Phosphate, Flaxseed, Salt, Fish Oil, Carrots, Cranberries, L-Threonine, Choline Chloride, Mixed Tocopherols (Preservative), Vitamin E Supplement, Ferrous Sulfate, DL-Methionine, Iron Amino Acid Chelate, Zinc Amino Acid Chelate, Zinc Oxide, Copper Sulfate, Sodium Selenite, Niacin Supplement, d-Calcium Pantothenate, Copper Amino Acid Chelate, Manganese Amino Acid Chelate, Riboflavin Supplement, Vitamin A Supplement, Manganous Oxide, Thiamine Mononitrate, Vitamin D3 Supplement, Vitamin B12 Supplement, Pyridoxine Hydrochloride, Calcium Iodate, Folic Acid, Rosemary Extract. In my opinion, dog owners should always read the ingredient label on the back of each bag. 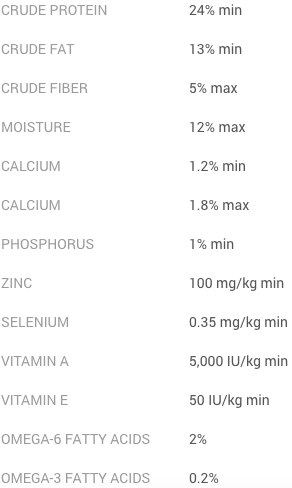 Furthermore, I always like to take a look at the first 4 ingredients to determine if I am receiving a healthy feed for my dog. Let’s take a look at the first four ingredients in the True Acre Dog Food recipe below. 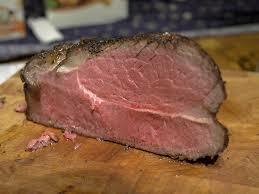 1.Beef – Dogs love the taste of meat, and beef is no exception. 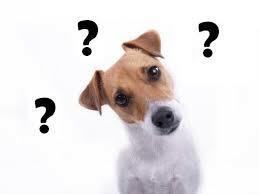 So what does this beef provide our dogs? It is an essential source of protein that our four-legged companions need which provides energy as well as essential amino acids. These nutrients assist in the maintenance of strong muscles and lean muscle mass. Make a healthy meat your #1 ingredient! 2. 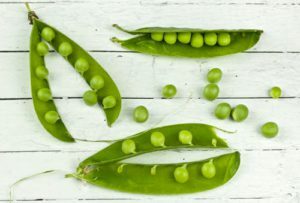 Peas – This ingredient has become somewhat controversial with pet nutritionists, veterinarians, and the FDA. Peas within a dog food recipe does provide some nutritional benefits such as dietary fiber, vitamins and a source of protein and which helps with digestion. Those who have concern with peas in a dog diet point to the ‘lectins’ found in peas. Lectins are sticky molecules that can cause issues if these sticky molecules begin to attach to the intestinal lining. There are researchers who believe this process can lead to issues involving thyroid, diabetes, arthritis, and cardiovascular disease. 4. Poultry By-Product Meal – By-products from poultry are those parts of the animal that remain after the meat has been removed. Poultry by-products are considered to be high-quality ingredients that actually provide your pet with nutritional value. Included in these benefits are a quality source of healthy fats, protein and essential vitamins and minerals. According to 56 dog owners who have purchased this product and placed their reviews with Chewy, 77% of dog owners have given this product a 5 Star rating out of 5. Another 12% have given this product 4 Stars, 2% a 3 Star, 4% a 2 Star, and 5 % a 1 Star. You can find these recipes in a couple of flavors that include the Beef and Chicken. For those interested in purchasing this product, there is a limited time offer where you can receive $10 off your first three bags of purchase. Simply click here to learn more about this offer to receive your product in just a few days. 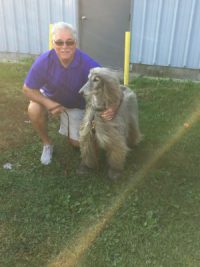 I certainly hope this article has been helpful to you and given you some further insight regarding the True Acre Dry Dog Food. As you can see from the reviews listed above, many dog owners are quite pleased with this product and have given it a 5 Star rating. For those pet owners looking for a recipe without grains, wheat, corn or artificial preservatives, this a product that may be of interest. ← Have You Tried American Journey Salmon & Sweet Potato Recipe Grain-Free Dry Dog Food?